What turned you on to weather? I'm sure it’s the answer that most everyone else gives. I had a few experiences when I was young. I was living in New York, on Long Island until I was six, and then Albany until I was in the third grade. We did have a few hurricanes in the ‘80s. I remember Hurricane Gloria. I was only six years old, but I do remember looking out the window and seeing strong winds blowing leaves and trees around. I was off from school that day, of course. Other than that, it was mainly snowstorms. Lots of big ones up there! At that point, you were set? Not a lot of money there? No, so I toyed with being an orthodontist (because I had braces at the time), or maybe an endocrinologist, something where I was a doctor. But by eighth grade I realized that there is no way I cannot do weather. You carried that through high school? Yes, and in high school, I was craving to learn more about it, but there isn’t much to learn then. When I was there, I took an Earth Science class. When we got to the meteorology section, it was almost as if the teacher had me teach it because I already knew so much about it. She was a biology teacher and did not know that much about it, so she had me heavily involved with the class. That was very cool. I graduated valedictorian in my class, and had lots of opportunities. One was at North Carolina State University, which would be in-state as I was living in Asheville at the time. Another was the University of Albany up in New York. So, I was familiar with both locations. I got accepted to both and received scholarships to both. I decided to stay in-state at North Carolina State. It had a little bit stronger of a marine program, and I was interested in the oceanography side of things. The department was called Marine, Earth, and Atmospheric Sciences. And you dove in quickly. I had taken a lot of AP (advanced placement) classes in high school, so I was able to jump right into meteorology in my freshman year, which a lot of people don’t get to do. By the end of my sophomore year, the Department instituted a Bachelor of Marine Science program. There was enough overlap where I could do Meteorology and Marine Science. So I got a double major. So far, you are definitely an over-achiever. Were you able to intern somewhere? During the summer between my sophomore and junior year, I was accepted to intern in Boulder, Colorado, working at the NOAA Environmental Technology Laboratory. I was actually doing hurricane research with a couple of other people, looking at (1995’s) Hurricane Opal, its formation in the Gulf of Mexico and the parameters that led to its rapid intensification. That was my first introduction to hurricane research and forecasting. It was an awesome opportunity. I did an internship at WRAL-TV in Raleigh. Greg Fishel was the chief meteorologist, and is still there. It was pretty much my entire senior year, working behind the scenes, helping them with graphics. Did it give you any interest in working in front of the camera? Yes and no. I am kind of a shy person by nature, so being in front of the camera all of the time is not my thing. You do have to be a bit of an extrovert to do that, and I am not. I had a real good time working there and learning things, but I decided I would go on to grad school instead. I applied to NC State and the University of Miami. UM flew me down here. I saw the school, liked it, and I came to UM and began their Masters program. I was there for about a year, took a lot of the classes, did the comps, and actually got a high pass and could have gone for a Ph.D. if I had wanted. But you passed on that opportunity? Yes. The way things fell in line, after that first year I had actually got an internship here at the hurricane center. I was only in Miami for a week when my advisor told me that I should go up to Ft. Lauderdale to the AMS Conference that was being held there. A couple of people that I knew from NC State also said I should go the Conference and meet Jamie Rhome. 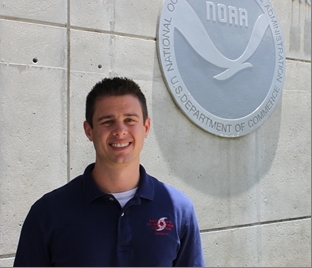 He went to NC State and worked at the hurricane center. So I met him and we become friends. Knowing him and knowing some of his friends, I got into the hurricane center crowd a little bit, and was able to get an internship that next summer. I was working in the Technical Support Branch (TSB). I was doing a little reconnaissance work, plotting up maps of flight tracks. I did a little satellite work, helping out there. It was mostly scripting and programming work. Then sometime that summer, a full-time position opened in the Tropical Analysis and Forecast Branch (TAFB). I saw that as a great opportunity as jobs do not open up very often here. I applied for the job and was lucky enough to get it. And that led to being a hurricane specialist. It did. I started in TAFB as an intern, spending a few years doing the surface analysis work. I became a marine forecaster in TAFB for a few years after that. Then, an opening occurred for a hurricane specialist in 2008, which was Michelle Mainelli’s position when she left for Washington DC. I applied for it and was fortunate enough to get it. You came in at the height of the 2008 hurricane season? I got the job in August, and Hurricane Ike occurred that September. It was ironic how it worked out. As a specialist, we write the Tropical Cyclone Reports. There’s a rotation that we do. So when I got the job, they slipped me into Michelle’s position in the rotation and I ended up getting Hurricane Ike. You work with a lot of very talented people in the hurricane specialist unit. It is great in the HSU. There are eleven of us, and we each have our own little area of expertise. There is overlap, but it has fallen into place nicely as each one of us has their own niche. People know who to go to if there is a question on a specific topic. I know I should go to Jack (Beven) if I have a satellite question, or I should go to Richard (Pasch) and Mike (Brennan) if I have a modeling question. We are all good at forecasting, but you need those niches. What do you consider your niche to be? One is social science. It has become really big in the (National) Weather Service. People are realizing it is not just making the forecast and getting it out, it’s also making sure people understand that forecast. In the end, the forecast is almost useless if people cannot understand it. There’s been a push in the Weather Service to try to find new methods of getting the forecast out easily and it being more understandable. Last summer, I attended a Conference in Boulder sponsored by NCAR called WAS*IS. That’s Weather and Society Integrated Studies. It was a 10-day workshop where meteorologists and different types of social scientists came together. We had anthropologists, psychologists, economists, and communications experts. It was a good forum to exchange ideas, and have this core group of people to reach out to in the future. I know meteorology, but I don’t have expertise in those other fields. Yet, I have to understand some of those fields in order to make the forecast more understandable. On the flip side, social scientists want to help with that, but they don’t know meteorology. So, it’s a really good marriage. Then you are the social science focal point here? I’ve been working with some great social scientists on a number of different projects. One is looking at the appeal to people of our graphics, and if they understand it. I am getting on my soapbox now, but I don’t think the cone graphic shows people what we really want them to know. It says nothing about the hazards, and every hazard is different for each storm. The cone is getting smaller as the track forecasts improve, but storms are not getting smaller. That means there is larger area of the storm outside of that cone, and it is becoming more misleading. It is going to be quite a challenge to change on old habit. That’s why we are putting a lot of effort in conducting surveys with people and in focus groups, trying to understand what people are seeing when we show the graphics to them. That way we can tailor it to better understand it. When I go back to the storm surge area here, you seem to be the “go-to” guy when (storm surge team leader) Jamie Rhome is not around. Do you have an interest in storm surge? Because I have the double major in Meteorology and Marine Sciences, it has always interested me. I remember back in college we had to do a class project for a hurricane. We were in groups forecasting different aspects of the storm and I was in the storm surge group. I knew even back then that it was a big interest of mine. Being at the hurricane center, I volunteer my free time to help out in the storm surge unit, whether it’s a project, outreach, interviews, whatever they need. Where are you going to be five, 10 years down the road? That’s a good question, because I never thought I would get to this position this fast. I am really enjoying the job now, and haven’t really thought ahead of what I want to do next. One thing that has been on my mind lately is, because of the social science I have been into, it really fits nicely into what a WCM (Warning Coordination Meteorologist) does. Their job is making the public understand the warnings and forecasts we put out. That’s always a job I thought I would do one day, whether its here at the hurricane center, a local WFO (Weather Forecast Office) or even another national center. My biggest passion is travel. Over the past decade, I have had the opportunity to take a lot of cool trips. The traveling bug started when I was a kid. My family and I had taken several cross-country car trips. Just imagine my parents in the front seat, and me, my sister and brother in the back seat. In fact, there are only three states that I have not been to: Hawaii, North Dakota and Michigan. I really love traveling outside of the country. Just in the past decade or so, I’ve been to Europe and South America several times, including Chile, Peru and Costa Rica. This past November, we went to Morocco, which was amazing. We went to the Saharan Desert and took a camel caravan to the dunes, and spent the night in tents there. There was no light pollution so you could see the stars. It was awesome!